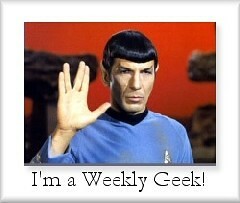 For this week’s Weekly Geeks, we are being asked to share books (fiction or nonfiction) and/or movies which center around an animal or animals. So I thought for mine, I’d highlight a series I may have highlighted here previously, but if I have, it’s been a while ago. The series of which I speak is the Big Red And Other Great Dog Stories series by Jim Kgelgaard. The books are, in order, Big Red, Irish Red, Outlaw Red and Stormy. A shining, silky red from nose to tail, the dog was trotting up the path Danny was walking down. His eyes were fixed on Danny, and his tail wagged gently a couple of times. Ten feet away he stood still, his finely chiselled head erect and his body rigid. Spellbound, Danny returned the dog’s gaze. He knew dogs, having owned and hunted with hounds since he was old enough to do anything. The red dog was not a hound– Danny knew vaguely that it was called an Irish setter– but never before had he seen any dog that revealed at first glance all the qualities a dog should have. Danny walked forward, and knelt to ruffle the red dog’s ears. “Hi, boy,” he said. “How are you, Red? Like Danny Pickett, the boy who encounters the red dog, I was enthralled from the first moment I was introduced to the dog. After all, I was a boy who had his favorite dog, Scoot. I instantly could relate to the love that Danny showed for this dog that he didn’t even know but whom he would come to know over the course of 218 pages of what I consider the best dog story ever written, Big Red. Of the series, as often, but not always is the case, the first one in this series is the best. The second and third ones, Irish Red and Outlaw Red, are about Big Red’s sons, Mike (Irish Red) and Sean (Outlaw Red). As in the first one, where Big Red has to do battle with a bear and a wolverine, in the second and third ones, Mike and Sean face their own challenges: Mike, a snowstorm and a puma; Sean, a coyote and himself. Like in Sheila Burnford’s The Incredible Journey, another of my favorite animal stories, the stories aren’t so much about the humans in the story but about the animals themselves. In the fourth of the series, Stormy, a boy Allan Marley is living alone on a lake because his father is serving a prison term when he encounters Stormy, a large black retriever. Like the other three, this one focuses on the interaction between a dog and his master, but also throws in a little bit of a murder mystery. Of the four, I believe, this one is the weakest, but maybe that’s because I liked the connections among the other three, and this one was missing those connections. However, if you have children, boys or girls, but probably especially boys, the entire series is a must-read for them, with each one a quick and engaging read. This entry was posted in Books, Mind, Weekly Geeks and tagged Books, children's books, Jim Kjelgaard, Weekly Geeks. Bookmark the permalink.